In my inbox I see hundreds of people sharing their language learning woes every day, and in person I meet many people everywhere I go who struggle to start a language. There are many reasons they give, some of which are valid, but many times they are just excuses. Nothing reminds us more of this than when we see people with genuine setbacks in life, who go ahead and outperform people who definitely have it easier. Today I want to share such a story, and it comes to us from Angela who interviewed Yang Meng Heng to share his story with the world, and how he learned his languages despite a major setback. Take inspiration from this, and remember that no setback is ever big enough to stop you from achieving your dreams. Over to you Angela! Yang Meng Heng, or Jesse as his foreign friends call him, is a 22-year-old college student from a small village in Yunan, China. He's a champion swimmer, a published author, and an inspirational speaker. He speaks English, Cantonese, and Spanish fluently – in addition to his native dialect and Mandarin Chinese. Not impressed yet?? Jesse also has no arms! As a child, Jesse was in an accident that completely changed his life. One Sunday afternoon, 7-year old Jesse was playing alone in some fields near his village home. Curious and excited, he found an electric water pump. Wondering at what he thought was a plastic water bottle on top of the pump, he reached out and touched the machine. It would be the last time Jesse would use his hands to reach for anything. The ungrounded machinery gave Jesse an electric shock that nearly took his life. I still remember reaching for that white bottle, and then nothing – it was like a shadow. Hours later Jesse awoke in a hospital bed, his arms burned so badly that the local doctors decided amputation was the only way to save his life. At such a young age, Jesse had no idea what he was about to lose. ‘People take their arms for granted,' Jesse says explaining all of the ways he had to adapt to his new life, including learning how to walk again. Jesse's parents pushed him to be independent. ‘My parents were very wise. They told me that my life is my own, they can't control my life, they can't live my life for me.' 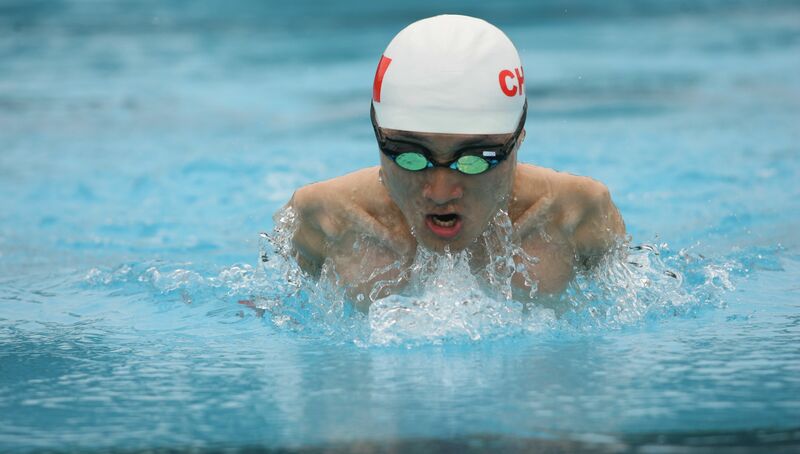 Despite the many challenges he faced, he went on to continue with his childhood aspirations of becoming an athlete, competing as a swimmer in the Chinese Paralympics. In fact, no matter what dream he wanted to go after, Jesse wouldn't let his disability get in the way. He is living proof that “reasons” (or… excuses) are not what stop us from accomplishing our goals. ANGELA: You have accomplished so much for someone so young, only 22 right? What has pushed you to work so hard? JESSE: I think in most people's mind, people like me are not supposed to seize their future or seize a destiny. They don't expect us to do anything great. But after the experience I had with the accident, I can't take my life for granted. It's a gift. ANGELA: I think a lot of people, including myself, see someone who is different, maybe with a deformity, and we don't really know how to act around them. Do you think people treat you differently? JESSE: No. Well – for a while they did, but by the time I was in high school I had gotten out from under that shadow. JESSE: I changed myself. How you see yourself, is how others see you. ANGELA: What first got you interested in public speaking? JESS: When I was in high school, a speaker came to my school, and his speech motivated me, but it wasn't the content of the speech that motivated me. I just saw this guy, who was pretty normal, giving this speech, and he got all this applause from the audience, and I thought, if he can do this, why can't I? ANGELA: What is the message that you want to get across to the students you speak to; if they just took one thing away from your presentation, what would you want that to be? JESSE: To break out from limitations, to stop believing they can't do something, and to start working so that they can. ANGELA: What kind of advice do you give to Chinese students when it comes to learning English? JESSE: I tell them to recite English articles and to imitate native English speakers. I think imitation is a great way to learn a language. Its how we learned as children. ANGELA: Even though all Chinese students have to study English, from my experience, most cannot communicate very well, so what makes you different from the rest? JESSE: I was more specific in my study. I set goals. For example, during my first semester of college, I had a goal to become friends with at least two foreigners, which I did. I would eat with them and hang out with them, all while speaking English. ANGELA: I think one of the more important – probably the most important part of learning a target language is to speak to native speakers of that language. JESSE: Yeah, sure, of course. ANGELA: Unfortunately, I think a lot of language learners worry about what natives will think of them. ANGELA: Right, so I want to compare that to your situation. You say that people stopped treating you differently because you saw yourself differently, and I think the same is true of how people will see language learners. If you see yourself as this annoying language learning leech, sure, you might bother some people. But if you are going at this with the real intention of being friendly to people and building a relationship with someone while also improving your language skills, I think that will come across as well. JESSE: I would definitely agree with that. ANGELA: What was your schedule like when you were learning English? What was your routine? JESSE: I got up at 6 am every morning and recited English articles for half an hour. Then I would run to school. For the rest of the day I would spend every second I could studying, even when I was on the toilet. I would sit with a book in front of me and recite more English articles. Angela getting caught following Jesse's advice. ANGELA: When someone wants to accomplish something, like they want to learn a language? JESSE: But they just want! They don't act!! ANGELA: Right, so they give “reasons” for why they can't learn a language. What excuses do you hear the most and how do you respond? JESSE: The truth is, there's only one reason: they are lazy. But there are three excuses I hear all the time. I don't have time: Squeeze time. Use rubbish time to learn a language, like when you're in the bathroom or on a bus. I'm not talented at learning languages: Every person possesses the talent to acquire a language. How could they pick up their mother tongue, if they didn't have the “talent”? I don't have the opportunity to learn: People create opportunity for themselves. You can't wait for it. You'll be waiting forever. ANGELA: What do you think is the biggest struggle people face with language learning? Why do so many people fail? JESSE: They don't have the real desire. They don't have the courage. Success or failure depends on how much you want it. You have to want it badly enough to work for it. ANGELA: What is the one lesson that you want people to learn from your story? JESSE: I want people to know that they can break away from limitations. It's easy to make excuses. It's painful to do the work. But you have to make yourself feel a little pain to get the results that you want. Now some of you may read this and then think, well there must be something special about Jesse. You are right! There is something special about Jesse. He had two very obvious “reasons” not to be successful: minus one right arm and minus one left arm. Anyone can take his or her given circumstance and find “reasons” to give up on what they want to achieve. Jesse didn't even need to look for excuses. They were right there staring him and his whole world in the face. It would have been easy for Jesse to use his circumstance as a reason not to try, but he didn't. Jesse chose not to let his circumstance run his life. So the “reasons” that made it hard for him to succeed, did not stop him from graduating high school with the highest grades in his county, it didn't stop him from being a champion swimmer or a public speaker, it didn't stop him from speaking 5 languages, and it won't stop him from achieving any of his other dreams. As a child, faced with the loss of two limbs, Jesse grew with a perspective on life that has helped him to achieve success in all facets of life. But we don't have to wait to experience incredible loss in order to have incredible motivation. No matter what challenge may be in your way, remember, excuses are just excuses. If you'd like to learn more about Jesse, check out his blog! And if you'd like to hear more from Angela you can read more at her blog!